Drain pineapple, reserving juice. Add enough water to juice to measure 2 ½ cups; pour into saucepan. Bring to a boil. Pour over gelatin mixes in large bowl. Stir 2 minutes until completely dissolved. Stir in pineapple, cranberry sauce, walnuts and apple. Spoon into 24 paper lined muffin cups. Refrigerate 2 ½ hours or until firm. Remove liners. Makes 24 servings. Preheat oven to 375. In mixer bowl, blend cream cheese, pumpkin, sweetened condensed milk, flour and spices until combined and smooth. Unroll crescent rolls, separate and lay flat. Evenly spread 1 ½ T of pumpkin mix over dough. Roll into crescent shape and sprinkle top with sugar. Bake 11-13 minutes until golden brown. Using damp paper towels, wipe mushroom caps clean; remove and discard stems. In colander, squeeze liquid out of spinach until dry. In large bowl, mix spinach, feta, cream cheese, green onions and ¼ tsp salt until well combined. Fill each mushroom with heaping teaspoon spinach mixture; top with Parmesan. Transfer to 15 x 10 jelly roll pan; bake at 350 for 20 minutes or until mushrooms are tender and filling is golden brown. Blend untrained tomatoes and jam in medium sauce pan; heat over medium heat until bubbling. Add meatballs; heat additional 10 minutes or until heated through. Place on serving platter. Place cream cheese in shallow casserole. Microwave on 50% power until cheese is softened, 2-3 minutes. Stir in drained chicken, ranch dressing, pepper sauce and 1 cup cheese. Sprinkle top with remaining cheese. Microwave on 100% power 2-4 minutes, until hot and bubbly. Serve with crackers, tortilla chips or celery sticks. For the main course, we try to split the meal according to the distance they have to travel to my house. I do the bulk of the side dishes but several of my dishes can be made a day ahead and heated up on turkey day. The Momma does the ham and my sister does the turkey because I do all the appetizers. The Momma also does the mashed potatoes, the deviled eggs, the biscuits/rolls, and the pumpkin pie. My sister does the stuffing, the collard greens and the fruit salad. Melt butter in casserole dish. Add cream style and whole kernal corn. Add cornbread mix and sour cream. Beat 2 eggs with fork in bowl and add to mix. Stir well. Top with cheese. Bake at 350 for 1 hour, uncovered. Mix soup, milk, soy sauce, pepper, beans and 2/3 cup onions in casserole dish. Bake at 350 for 25 minutes. Stir. Sprinkle with remaining onions. Bake 5 minutes. Melt stick of butter in casserole dish. Mix cooked sweet potatoes, sugar, vanilla, eggs and milk together until well combined. Pour evenly into casserole dish. In small bowl, combine pecans, flour, brown sugar and cinnamon. 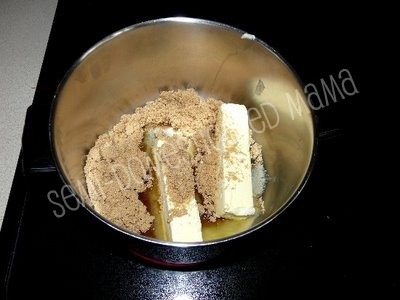 Add remaining 3T butter and rub in with fingers until mixture is evenly moistened and forms clumps. Sprinkle over sweet potato mixture. Bake at 350 for 30-35 minutes or until topping is browned. Bring water and sugar to boil in saucepan. Add cranberries and return to boil. Reduce heat and boil gently for 10 minutes, stirring occasionally. Pour sauce into bowl; cover and cool. Combine all ingredients in med saucepan. Bring to boil over high heat. Reduce heat to maintain gentle boil. Cook, stirring occasionally until carrots are tender and liquid has reduced to a glaze, about 20 minutes. My favorite part of the meal, by far, is dessert. My thighs don’t lie people, I love my dessert. The Momma makes a killer pumpkin pie from scratch but I don’t have the recipe handy. We make a lot of desserts. A lot. And we never have leftovers, the vultures clean us out. I swear to you, I saw The Brother Law go back for a fourth peice of pie last year. Fit piecrust into 9” pie plate according to package directions. Fold edges under and crimp. Beat cream cheese, 1 egg, ½ cup sugar, 1 t vanilla and salt at medium speed until smooth. 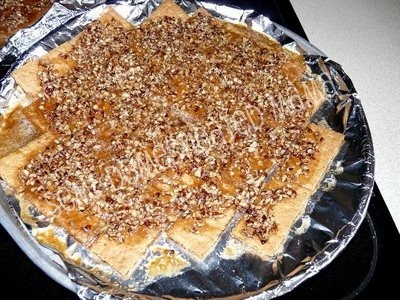 Pour cream cheese mix into piecrust, sprinkle evenly with pecans. Whisk together corn syrup, 3 eggs, ¼ cup sugar and 1 t vanilla. Pour over pecans. Place pie on baking sheet. Bake at 350 on lowest oven rack for 50-55 minutes or until pie is set. Cool 1 hour. Heat oven to 400. Grease shallow dish with softened butter. In large bowl, whisk pumpkin puree, buttermilk, brown sugar, 4 large eggs, flour, unsalted butter, pumpkin pie spice, baking powder, baking soda and salt until well blended and smooth. Pour into prepared dish. Bake 45 minutes or until puffed. Let cool until warm. 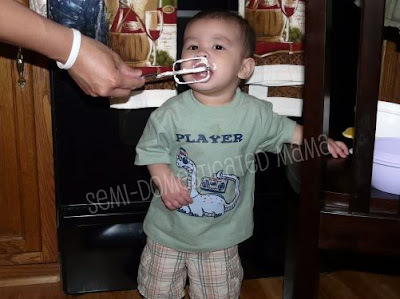 Spoon into dessert bowls and top with scoop of vanilla ice cream. In large mixing bowl, beat cream cheese on med speed until fluffy. Add sugar. Beat until well combined. Fold in whipped topping. Spread in crust. Refrigerate 2 hours. Top with canned cherry pie filling. Mix sugar and butter until well combined. Add pecans, eggs, corn syrup, and rum; stir until combined. Pour mixture into pie shell. Bake at 375 for 10 minutes. Reduce temp to 350 and bake 35-40 minutes longer or until filling is set around edge but center jiggles slightly. Cool completely. In bowl, with mixer on medium speed, beat sweet potatoes and cream cheese until smooth. Add sugar and half and half; beat 5 minutes or until sugar dissolves. Add butter, eggs, vanilla and cinnamon; beat until blended. Pour mixture into pie shell. Bake at 350 for 1 hour or until filling is puffed and set around edges but center jiggles slightly. That pretty much sums up our Thanksgiving day feast. For Christmas, we are much more low-key. Typically, The ‘Laws do not come for Christmas Day. My parents and my sister usually join us around mid-morning. A few years ago we decided that we did not want to do the traditional formal Christmas Day meal. Instead we began our own tradition of doing a Christmas brunch. My sister and I do all the cooking, it’s a day for my parents (especially my mom) to just sit back, relax and enjoy her grandkids. We have a few dishes that we make for Christmas brunch every year and they are so yummy. Heat oven to 400. Grease casserole dish. Cook sausage in skillet until no longer pink; drain. Stir together sausage, potatoes and 1 ½ cup cheese in baking dish. Stir bisquick mix, milk, pepper and eggs until blended. Pour into baking dish and stir. Bake uncovered 40-45 minutes. Sprinkle with remaining cheese. Bake 1-2 minutes until cheese melts. Butter a 9×13 baking dish. Arrange bread in bottom. In large bowl, beat together eggs, milk, cream, vanilla and cinnamon. Pour over bread slices, cover and refrigerate overnight. The next morning, preheat oven to 350. 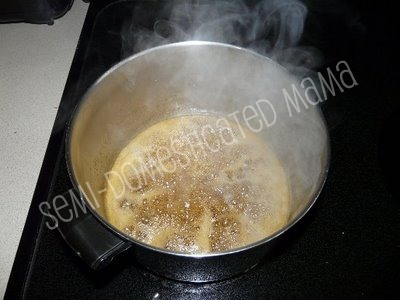 In small saucepan, combine butter, brown sugar and corn syrup, heat until bubbling. Pour over bread mixture. Bake in oven, uncovered for 45-55 minutes. This year I am also going to make the Pioneer Woman’s amazing Cinnamon Rolls. Yummy!! And they taste even better than they look if you can imagine that. I took her advice and I now give these to each of our neighbors for Christmas. I’m a very popular person on our street come Christmas time. It’s all about the bribery, my friends, all about the bribery. My sister also brings her fabulous Biscuits and Gravy but I don’t have her recipe. They are scrumptous though and even my most picky child will clean their plate! So there you go. Our Thanksgiving and Christmas menus. This is why my jeans never fit come January 1st. I think I gained 10 pounds just typing these all out. Warning: The following snack may be extremely addictive. Consider it the crack cocaine of the dessert world. May cause moms to hide in the closet, shoveling handfuls into their mouths while snarling at the children. Line a cookie sheet with foil. 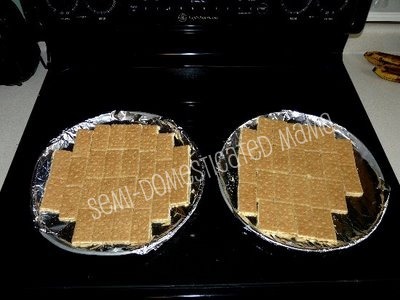 Break graham crackers at indentations; place in single layer on cookie sheet. 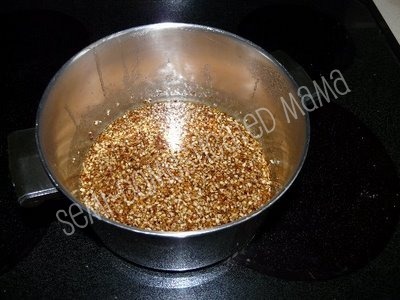 In large saucepan, combine butter and brown sugar. Bring to rolling boil over med heat, boil for 2 minutes. Remove from heat, stir in vanilla and then nuts. Pour mixture over graham crackers. Bake at 350 for 8-10 minutes. Let stand for 2-3 minutes. Here’s a close up of the finished product. It is very rich and very delicious. Plus it’s a recipe that the older kiddos can help out with. Fun for the whole family. 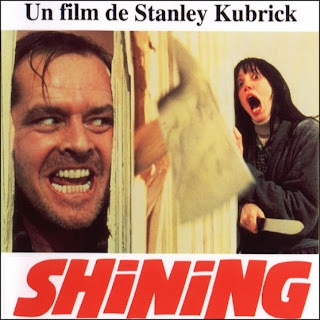 Of course, it’s only fun and games until someone opens the closet door. Then it’s like a scene from The Shining. Linked up with The Country Cook. We are BIG Football fans in this house. It’s a requirement, we’re Southern. Football is a religion in the South. We’re pulling for the Cardinals. Every year we host a HUGE Superbowl Party at our house. Last year we only had family attend because we had a newborn, this year there will be around 45 people not including the kids. It’s a huge party and we have a blast. I love to entertain, Matt says it’s a Southern thing. I just finished my menu for the party and thought that I would share a few of our favorite recipes in case some of you guys are looking for something to serve at a party. I usually do 3 different kinds of Dip served with Tortillas and Crackers. Combine all of the above ingredients and place in baking dish. Bake at 400 degrees for approximately 15-20 minutes and serve with crackers. In a medium mixing bowl, combine cream cheese, sour cream, crab meat, and green onion. Smooth mixture into a small baking pan. Sprinkle with grated cheddar. Bake at 400 F for about 20 minutes. Remove from oven and serve with tortilla or nacho chips. In a medium bowl, blend the taco seasoning mix and refried beans. Spread the mixture onto a large serving platter. Mix the sour cream and cream cheese in a medium bowl. Spread over the refried beans. Top the layers with salsa. Place a layer of tomato, green bell pepper, green onions and lettuce over the salsa, and top with Cheddar cheese. Garnish with black olives. Preheat oven to 350 degrees F. Cut bacon into thirds and wrap each strip around a little sausage. Place the wrapped sausages on wooden skewers, several to a skewer. 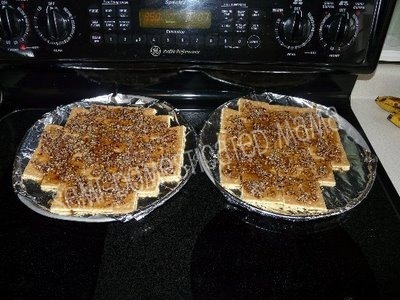 Arrange the skewers on a baking sheet and sprinkle them liberally with brown sugar. Bake until bacon is crisp and the brown sugar melted. Lightly grease a 9×13 inch baking dish. Fill a saucepan with water and simmer the mushroom caps over medium heat for 2 minutes, until the mushrooms begin to soften. Remove the mushrooms with a slotted spoon, drain, and let cool, hollow sides down, on paper towels, for about 15 minutes. While mushroom caps are cooling, combine the shrimp, cream cheese, Worcestershire sauce, garlic powder, and hot sauce in a bowl and stir to blend well. Spoon about 2 teaspoons of the shrimp mixture into the cap of each mushroom and place, stuffing side up, in the prepared baking dish. Sprinkle the Romano cheese onto each mushroom. Cover and refrigerate for at least 3 hours or overnight to blend the flavors and firm up the stuffing. Preheat an oven to 400 degrees F. Uncover the dish and bake the mushrooms in the preheated oven for about 15 minutes, until the cheese is browned and bubbling. In a medium-size mixing bowl, combine cream cheese, ranch dressing mix, and green onions. Spread this mixture on each tortilla. Sprinkle red pepper, celery, black olives, and cheese (if you’d like) over the cream cheese mixture. Roll up the tortillas, then wrap them tightly in aluminum foil. Chill 2 hours or overnight. Cut off ends of the rolls, and slice the chilled rolls into 1 inch slices. In a large bowl, mix chicken, mayonnaise and dill. Gently fold in grapes, and mandarin oranges. Spread the mixture on miniature croissants. Cover and chill in the refrigerator until serving. Preheat oven to 375°F. Cut potatoes in half lengthwise; scoop out centers, leaving 1/4-inch-thick shells. (Reserve centers for another use.) Cut shells in half crosswise. Place shells, skin sides down, on baking sheet; brush insides of shells lightly with oil. Bake 15 min. or until golden brown. Top evenly with Cheez Whiz, bacon bits, sour cream and onions. So those are some of our stand-by appetizer recipes that we fix every Superbowl. We also get several huge pizzas and cut them up into bite-size pieces. I still have to decide which desserts I’m going to make. I always have to make them last because otherwise, I eat them. Oh, the shame…..